Researchers in London are using novel ways to determine air pollution levels—and bring to light hazardous conditions in the bustling metropolis. And it’s all being done with the help of the ubiquitous—and pesky—city pigeon. As part of an experiment/promotional campaign, ten pigeons were recently strapped with tiny nitrogen dioxide (NO2) sensing backpacks and let loose all over the capital of England. While in flight, the pigeons were tracked by Plume Labs via GPS, and air quality measurements were then relayed to a website. The website, in turn, overlaid readings onto a map of the city, so site visitors could see levels of pollution. The findings: no area covered by the birds’ flight had less than moderate air pollution at any given time, while a good many of the areas of London had extremely high levels of NO2. Part of the campaign involved social media tweets coming “from” the pigeons in the form of NO2 updates linked to geographic mapping. While it seemed like a whimsical novelty promotion, the tweets bore real data on pollution levels. Overall, London has notoriously high levels of air pollution, and surpassed European Union air pollution limits for 2016 in only the first week of the year. What’s more, 9500 deaths in London are attributed to air pollution, so the air quality threat is very real. 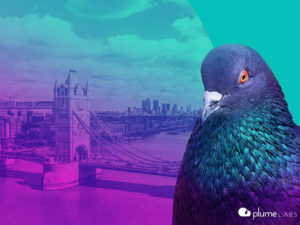 Currently, Plume Labs is expanding the test beyond its airborne patrol, seeking 100 runners, cyclists and “pram pushers” (people using baby strollers, for you non-Anglophiles out there) to get a better read on areas where the pigeons don’t fly. This, in turn, will be used to fuel an awareness campaign about reducing carbon emissions.